MANILA, Philippines – LET RESULTS. 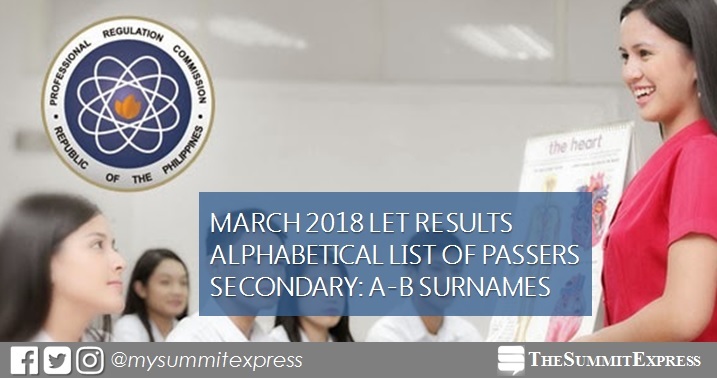 The complete list of passers for March 2018 Licensure Examination for Teachers (LET) Secondary level is officially released online on Wednesday, May 23. The names of examinees (A-B Surname), who have successfully hurdled the exam are available on this page. The Professional Regulation Commission (PRC) and the Board of Professional Teachers (BPT) announced the full results of teachers board exam conducted on March 25, 2018 in at least 20 testing locations nationwide. Takers may view on this page the alphabetical roll of passers for A to B Surnames. The March 2018 LET covers three (3) parts for Secondary - General Education (20%), Professional Education (40%) and Specialization (40%). In order to pass March 2018 LET, an examinee must get an average rating of not less than 75% and must have no rating lower than 50% in any of the tests, PRC said. Note that passing the LET and having valid professional license are necessary before the practice of teaching profession in the Philippines. Otherwise, those who will violate may face fine and imprisonment based on penal provisions. All takers of the teachers board exam may verify their ratings online. Provide the required information to verify your identity. It will be available in few working days after the release of results. Reliable source and the 'ultimate reviewer' of CBRC Dr. Carl Balita hinted on his Facebook posts that results may be released until May 23. On May 19, Balita shared: "When the sum of the day equals with the month, God will LET DREAM and the DREAMER be ONE." This can be equated to May 23 (2+3=5, 5 is the 5th month of the calendar).